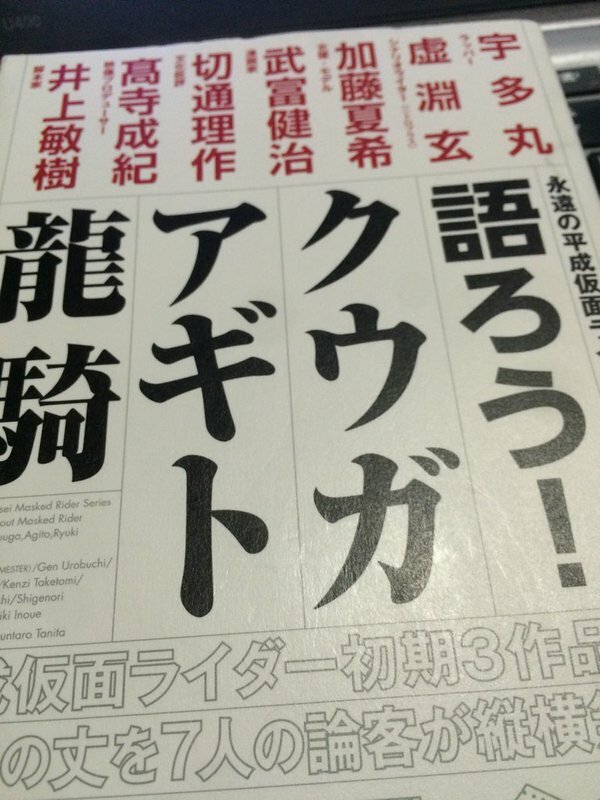 Book of interviews with various people regarding Kuuga, Agito, and Ryuuki. -Interview is from before he was allowed to talk about being on board for Gaim. They allude to it but end with him saying he's not allowed to talk about it yet. -He says that working on tokusatsu is "probably" (once again, not allowed to talk about Gaim yet) completely different from working on anime, because there are a lot of factors outside the writer's control, like the belts. He "thinks" the writer is given the belt first and it told to write a story around it. Up till now he'd written stuff completely freely so it would be a huge challenge to him. -Most of the Showa riders aired when he was a young child and he didn't see most of them, he thought the shows were scary. He first got into it in middle/high school when Black aired, and it was the first rider he watched in realtime (he got to know the other Showa riders later). -He was influenced in his youth more by anime like Votoms than by tokusatsu. He was in elementary school and really into model kits when Votoms aired, and he loved the realism of how the Scopedog is only 4 meters tall and composed of identifiable everyday components like ladders and hooks. -While he wasn't in the Rider generation, he did watch other tokusatsu stuff like Denjiman, Sunvulcan, Goggle V, Gavan, and Sharivan. -He didn't watch all of RX, but loved Black, especially the "no future"-ness of how Golgom would win regardless of which of Black and Shadow Moon won. He loved the manga version's ending more, where it's left ambiguous if it was Black or Shadow Moon who won. -Kuuga is his favourite rider. When it aired he was already an adult and a writer (Phantom was released one month after Kuuga started airing), and he started watching it wondering what they were planning to do with Kamen Rider all of a sudden after so long. He found that they were going all-out, making a show to be seen by children that isn't childish. -He loved the realism involving the police acting like what one would assume they should if monsters suddenly showed up. Also how it wasn't just the rider, but all the people- The police, the doctors, the researchers, the technicians- Using their own power to play their own parts in fighting the enemy- And figures that it must've been comforting to children to see how reliable adults are. A lot of works at the time revolved around people having special powers as a precondition, but Kuuga was different as in it what mattered was more fundamental things like courage and responsibility. Unlike other tokusatsu shows where military types fight the monsters with supertechnology and never manage to accomplish anything, the police in Kuuga have nothing special but still manage to fight the Grongi competently simply by never giving up and continuing to protect civillians. Kuuga is the story of how people fight paranormal phenomena by using their knowledge and organisational capability, and there just happens to be a guy with superpowers helping out. -(Upon the interviewer mentioning Kiritsugu): While he did flesh out Kiritsugu, it was really Nasu who created him; Kiritsugu is ultimately a negative of Shirou. -He says the Grongi are the greatest monsters; What's scariest isn't monsters, but people. When Kuuga was airing there were a lot of scary incidents going on, and so what children felt was a more realistic sort of fear, like of the possibility that maybe your next-door neighbour might be a murderer. The Grongi are basically serial killers- They usual look like normal humans that you can't tell apart from anyone else, but they actually go around killing people based on values a regular person couldn't even begin to understand. To a child, that's the worst possible kind of monster. -(Upon the interviewer mentioning a Madoka Magica interview where Urobuchi talked about the importance of "poison" in fiction): It was the poison in stuff like Kamen Rider (though he was too scared of it to watch much) and Votoms that allowed him to get through hard times, having him think "well at least it's not as bad as THAT". In this day and age most people don't go to war or starve or whatever, and so people need to take in some poison, as a sort of inoculation, through fiction. The Grongi were a fantastic poison. -The Grongi were real-life societal fears (unlike other tokusatsu stuff like schoolbuses getting hijacked) translated for children. And that sort of fear still exists, so Kuuga doesn't get old at all. 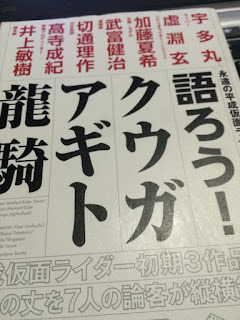 -(Upon the interviewer mentioning how killing is a game to the Grongi): It was magnificent how they used that setting; Though it's a game to the Grongi, they're serious about it, and their values are so different than that of humans that there's no room at all for negotiation. -(Upon the interviewer mentioning Vjedogonia): Vjedogonia was heavily influenced by Kuuga because he loved Kuuga that much. The story as a whole borrowed heavily from Kamen Rider, and the episode titles all being two kanji was inspired directly by Kuuga. -To Urobuchi, Kuuga was Kamen Rider's starting point and origin point and a completely straight ball. It was the ideal way to start. -His first impression of Agito was "Kuuga Deluxe"- Kuuga, but now with three riders, and the police guy becomes a rider too. The beginning and middle bits were fantastic, and the last parts (everything after Kino died) turning out how they did was disappointing. He was especially looking forward to the bit in the OP where G3 points his gun at Ozawa, which never happened. When he thinks about that he realises how tokusatsu stories can change completely based on all sorts of factors outside of the writer's control. But one of his favourite moments is at the very end, where an Unknown asks G3 "what are you? ", and G3 replies "human!". -He especially liked G3, which is so impaired and weak that it actually becomes cool. -It was nice how the three riders were completely different; Kind of like Black RX- Regular, mecha, and bio. He's sad that Gills was pretty much the last of the Amazon-type riders. -(Upon the interviewer mentioning Hibiki): He wonders if Hibiki is even really a rider. Ryuuki, Faiz and Hibiki made him doubt his eyes at first and go "wait, are you supposed to be a rider?". But they were all really great once you actually saw them in action, and he especially loved Hibiki's design. -He says Hibiki is another example of how difficult tokusatsu shows are. You could tell how they were trying to make a proper drama, but because ratings were bad and toys didn't sell it ended up like this. It tried to do something no rider had done before, but was forced to change course halfway through, and that's just sad. But he knows it couldn't be helped. -(Interviewer asks what Urobuchi thinks of how Agito didn't have Shouichi and Ryou transform into heroes, but instead depicted them transforming as something to be feared, them turning into monsters): He thinks that's the one thing Kuuga lacked, and he was hoping Gills would cover that, and was thus disappointed when Gills was barely relevant. He does think that if Gills made the story even more complex the children wouldn't have been able to keep up with it. -He questions if tokusatsu is an appropriate format for complex stories like Agito's, because of all the limitations and external factors that can easily change a story completely; If the mothers of the children watching the show got mad at something in it there's no way it's staying. -(Upon the interviewer mentioning Blasswreiter and Madoka Magica depicting the fear of transforming into a monster): That's precisely the fear Urobuchi felt when he first saw Kamen Rider as a child. Black left him with the impression that becoming a rider is a scary thing. Kamen Rider is about accepting and overcoming that fear, and he thinks that this might be subconciously affecting his works. -He mentions how he once saw an old video of Hitler youth vandalising a jewish house, and what scared him, even as a child, was the possibility that, if he had been born into that place and age, where all the adults say that it's that race that's messing up the country, it's their fault your father has no job, that what the Hitler youth were doing was what good children did, he might have done it as well. -(Upon the interviewer saying that Blasswreiter is "Urobuchi's Kamen Rider"): He says that when Itano came in, while he was still writing, he let Itano decide the entire setting and how things would go. Blasswreiter is thus Itano's ideal hero story, and so he thinks of it as "Itano's Kamen Rider". That the show was half Kamen Rider and half Ultraman was also Itano's doing. He thinks Itano wanted to do what he couldn't in Ultraman Nexus, and mentions how Itano complained frequently about how there's something wrong with Kamen Rider these days. Urobuchi's Joseph was originally a talkative guy, and it was Itano who changed the character into what he is. -Ryuuki was a huge surprise, completely outside the boundaries of Kamen Rider; He wonders if it can even be considered a Kamen Rider- It may have it in the title, but the story is on a completely different vector. But that's what made it so interesting. He thinks Kuuga and Agito did everything a Kamen Rider could and should do, and they needed a breakthrough, and that it was a good idea that they made a rider that wasn't. Ryuuki broke the chains and set the subsequent Heisei riders free. It was basically the G Gundam of Kamen Rider. -The idea of having villains and criminals as riders was unexpected and amazing. The only rider who looks like one is Ryuuki with the eyes; If you take the other guys, like Zolda or Ouja, and have them just stand somewhere, they didn't look like riders at all. You'd think they were from some other tokusatsu show. Ryuuki is a magnificent piece of work that became what it was by completely ignoring previous works. -He loved Ryuuki, and thinks that there are no battle royale type works that have surpassed it. The part where all the riders meet up for the first time, around 19, where it becomes a chaotic four-way, then a five-way fight, and all of a sudden Gai is dead. Gai and Ouja were sort of working together up till that point, then Ouja just betrays Gai like that out of nowhere. That's how battle royales should go. Everyone fights to a stalemate, then a new participant shows up and you get chaos everywhere. Gai lost because he let his guard down; People don't drop out because they're weak or strong, but because they make mistakes. -He referred to Ryuuki while writing Fate/Zero: Episode 4 and 15 were his own Ryuuki-style battle royales. He wanted those fights to have viewers know what he felt like when he was watching Ryuuki. -(Interviewer asks if he referred to Ryuuki while writing Madoka Magica which has similar themes): Kyouko was initially based on Asakura; A character showing up midway through who's nothing like what you'd expect for a character of the genre. But she ended up a good person because it's hard to make villains out of Aoki Ume's character designs. He finds it interesting how a writer can be influenced like that in anime, because in a novel the writer doesn't see any visuals until the book is done. In anime the writer changes stuff based on character designs and the voice actors' performances. During Blasswreiter, Itano told him "always come to recordings, because there's no telling what will happen", and he still follows that advice. -(Interviewer mentions how people with pure wishes tend to have horrible endings in Urobuchi's stuff, using Madomagi's Sayaka and Fate/Zero's Kariya as examples): He thinks wishes are a sort of magic that bewitches you and causes you to lose your balance, and many people don't realise how scary this is. He thinks that how simply chasing a dream or wish is considered to be beautiful is a scam perpetuated by conmen, because it makes it easy for them to do business. He thinks the quote "dreams and curses are the same thing" from Faiz was magnificent. The idea "if you buy this, your dream/wish might come true" a fundamental component of all sorts of business. They're telling people to have a vision of what they want to become, and to head towards it. That on its own isn't a bad thing, but to say that's all to it is plain deception. -(Interviewer says watching Sayaka and Kariya on the road to ruin is great fun, and wonders why people love tragedies): He says it's nothing new, it's something that's been around since Shakespeare. It might be in bad taste, but because people can watch it knowing it has nothing to do with them, they can enjoy it. But tragedies can be nourishment for people too; For example, by watching Jerid in Z Gundam, he decided to be a person who wouldn't be particular about unnecessary things. Jerid could've had a great life if he hadn't been so mad about Kamille chasing him all the time. There are plenty of people in this world that you'll never be able to beat, and if you worry about that you'll destroy yourself. Just take a different road. Tragedies leave this sort of stuff with you. -He never thought of himself as writing a lot of tragedies and bad endings. To him, adversities are things used to make a character stand out by showing how they think and act when they have nowhere to run. The darkness is there so that they can shine. -(On interviewer asking him what he thinks a hero is): He thinks Kitaoka/Zolda had it right when he said "a hero is something you fail to be at the moment you want to become one". A hero isn't something you try to become, but something you end up as. A hero is defined by how others see you, and isn't something you can reach on your own. -(On interviewer asking who he thinks, among the Heisei riders, is an ideal hero): He can't decide because the Heisei riders are too varied, and says that many of the riders probably don't even think of themselves as heroes, like Takumi/Faiz who doesn't even have a goal to try and accomplish. Takumi is just resisting his own fate, and that in itself, his way of facing himself, may be considered heroic by a third party. -However in Asian philosophy it's traditionally been thought that people think not just with their brains but with all of their nerves as well- With their entire bodies. If he had had a strong and healthy body he might never have become a writer. He doesn't regret becoming a writer and doesn't want to, and so while he does feel like he wants a mechanical body, he's also afraid that he could lose something from getting one, and that's a big theme to him. The fear riders feel when they transform is something you can easily understand if you have some sort of chronic disease, when sometimes you wonder if your disease is getting worse or if you're just getting a cold. And that's why he watched Agito empathising with Gills. -(Interviewer points out how multiple endings and loops are common in video games, and asks what Urobuchi thinks, as a game writer): They're appropriate since battle royales in general are very game-like. -(Interviewer asks why he thinks loop stuff like Ryuuki, Haruhi and Higurashi were popular in the 00s): It's something anyone who plays video games will imagine. The writer of All You Need Is Kill said he got his idea from video games' save/load functions, and everyone has died in a game and started over with the knowledge of what's coming next. Everyone probably thought of turning that into a proper story at the same time. -(Interviewer asks why Madoka was a loop): He came up with Homura first as a character who, while silent, stays by Madoka's side and knows everything. The best way to get that to fit was a loop. He wanted to make a sort of betrayal, where this mysterious person plotting stuff in the background you can't seem to trust turns out to be the person who was thinking of the protagonist the most all along. So the loop was just to justify Homura's actions. -Ryuuki was in 2002 and he was surprised that they did a loop at such an early point, and in a Kamen Rider. -(Interviewer says both mahou shoujo and Kamen Rider are a genre that have a set format, and asks if Urobuchi thinks there's anything in there that makes them particularly interesting): Having a long history means you can reach back into the past and take old parts out and rearrange them and skip explanations by saying "this happened before, you know what it is, so we're skipping explaining it". You can make shortcuts. (Interviewer asks if he means stuff like "but how and why do they transform WITH BELTS!?") Yes, and by skipping explaining that you can spend time on other things. -(Interviewer compares Ryuuki being different to Madoka Magica being different): He says that he had the intention of keeping Madoka Magica close to the format to some extend, at least with Mami up till episode 3. He felt that up to that point the series had stayed in line with the genre. Cosmic horrors like QB of course aren't seen in regular mahou shoujo shows but he didn't start with the intention of making him that creepy- That was the animators' doing. The cute manga version is closer to his original vision. -He thinks big changes like that happen in tokusatsu more. Because everything in anime is pure fantasy, it follows a perfect plan, and nothing really changes much from said plan. In tokusatsu like Kamen Rider though you don't need such a perfect plan; They change shooting locations, or cut down on a character when their actor is sick, all the time. And then there's toy sales, and complaints from parents. Tokusatsu is made in a short span in the midst of all these factors. And they're broadcast for so long too; Four cours is unthinkable for anime these days. -(Interviewer asks what stands out the most in the Heisei rider series as a whole to him): Kuuga was a masterpiece of Kamen Rider, while Ryuuki was a renaissance that brought the series towards an entirely new direction. Anyway there are many more riders coming out and it's too early to look back. -(Interviewer asks what kind of riders he wants to see): He'd like them to go back to the mindset that made Kuuga, but understands that that'd be difficult. Either way, he wants them to continue to remember whenever they make a new show that to a child it might be the first form of entertainment they ever see. It's tokusatsu stuff like Kamen Rider and Ultraman that serve as starting points for children of all generations, and through that starting point they expand their views to include more stories, and that position as a starting point is a proud and extremely important one. -(Interviewer asks what he thinks of how recent Heisei riders are lacking "poison"): He says it can't be helped. While he'd like poison, it's hard for that to be approved these days, and the franchise is just too big to be easily moved in that direction. The series is made by many people, and that includes the children's parents. Kamen Rider is a product of its age's parents' consensus. He's sad that the poison is gone, and sees it as a reflection of the current philosophies in child raising. -(The interview concludes with the interviewer hoping that one day we'll be able to see a poison-filled Kamen Rider made in Kuuga's mindset, by Urobuchi, and Urobuchi says that if he gets the chance he'll do his best).